Companion planting helps protect roses against insect pests by masking the scent of roses and steering intruders to other hosts or directing them out of the garden entirely. Certain herbs make ideal companions for the rose garden by inviting beneficial insects into the landscape. Companion planting also creates a garden that invites compliments through skillful use of texture and color, fashioning an ideal year-round retreat from the hustle and bustle of everyday life. 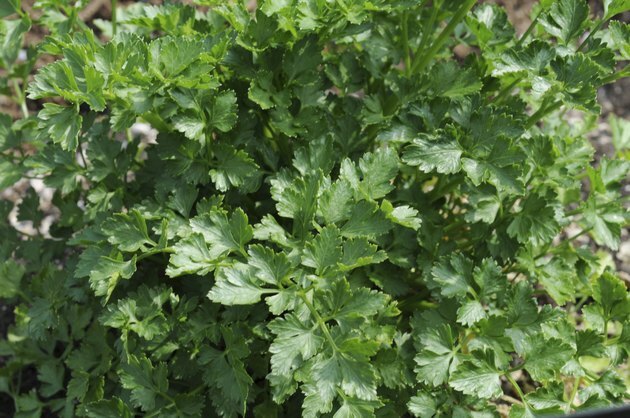 When planted with roses, parsley protects against the Fuller rose beetle. Rose beetle adults feed on the foliage of roses. The larvae feed on the rose's roots, chewing off the root hairs when young and girdling lateral roots as they grow. The damage done by the rose beetle causes death of the plant during severe drought and makes the rose especially susceptible to fungal infestation. The Fuller rose beetle, found in 30 states and Mexico, also attacks citrus, strawberries, beans, peaches, rhubarb and potatoes. Aphids feed on the sap secreted by roses, attacking the undersides of leaves. A severe infestation causes leaves to wilt and turn yellow. 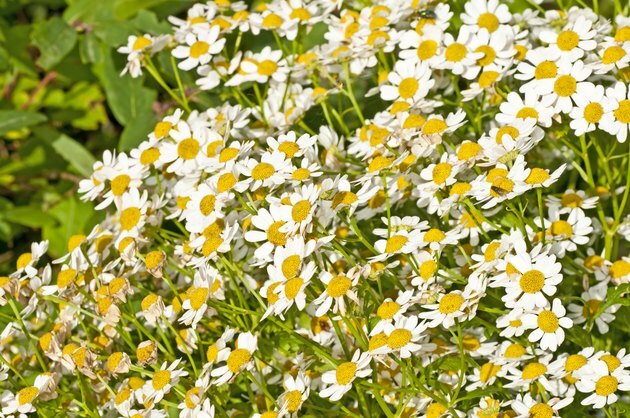 Interplanting feverfew may ward off these soft-bodied invaders. Feverfew is a member of the sunflower family native to Europe. This short perennial produces yellow flowers reminiscent of daisies, which bloom from July to October and exude a strong, bitter odor that repels aphids. Although an aphid attack makes the rose's appearance less than desirable, the good news is the aphid infestation does not do serious harm to established rose bushes. When companion planting for visual interest alone, look to dwarf conifers. 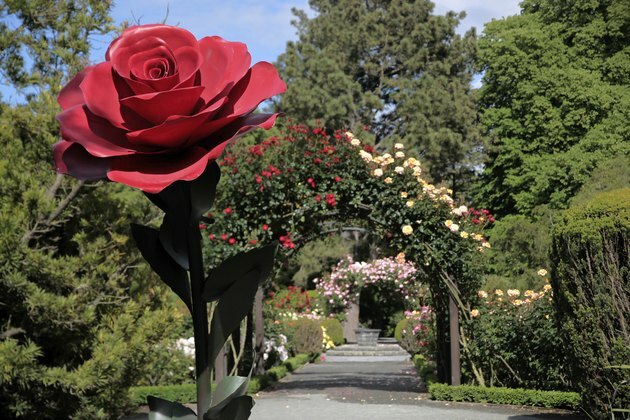 Roses planted in front of dwarf conifers complement them by bestowing striking color and an interesting contrast in overall appearance against the background created by the evergreen plants. Plant a shrub rose like Carefree Beauty in front of a dwarf blue spruce. This medium-pink rose is hardy from U.S. Department of Agriculture plant hardiness zone 4 to zone 9, blooms from June through frost and produces large, bright orange hips in winter. 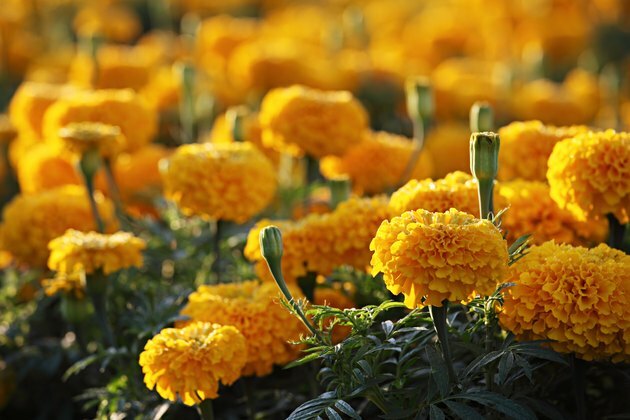 Marigolds have long been used to repel garden pests. Plant a double row of these fragrant annuals around the rose garden. The marigold's strong odor confuses pests and a substance given off by their root system drives back nematodes. Invite beneficial insects like ladybugs and praying mantis by planting savory, chamomile and thyme. 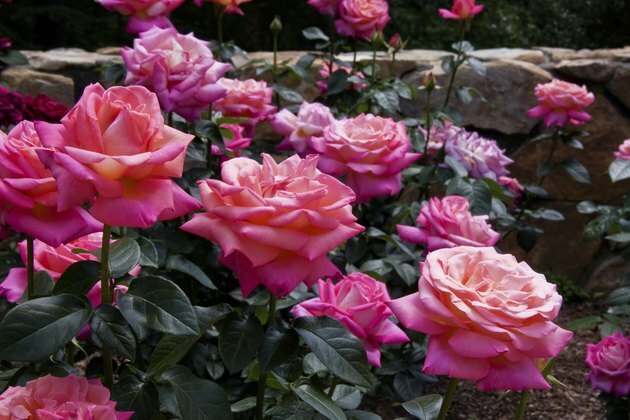 Roses require a lot of water, well-drained soil, sun and timely fertilization. When choosing companion plants, look for those that do not compete with roses for these essentials. Also look for plants with harmonizing colors and low-growth habits that disguise the rose's lower, bare branches. Steer clear of plants, such as nasturtiums, that attract aphids. Unfortunately, no companion plants have been found that protect roses from Japanese beetles. According to a study published in the "Journal of Economic Entomology," planting aromatic herbs such as garlic and fennel among roses may lead to an increase in Japanese beetle damage.